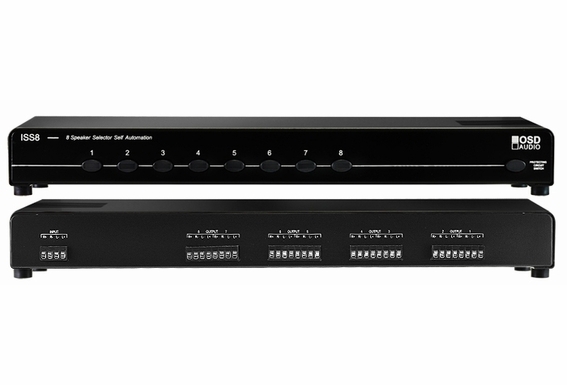 The OSD Audio ISS8 speaker selector is a powerful audio distribution system that can deliver audio to eight zones. Completely flexible and an excellent unit if you plan on expanding later, individual on/off selectors for each listening zone distribute one stereo speaker-level signal to eight, six or four stereo listening zones. The ISS8 also provides manual power protection that is activated from the rear panel. The manual power protection switch engages 10 ohm/15 watt resistors wired in parallel, three per channel in the ISS8. This protect your amplifier and provides up to 50% more power than other brands All ISS’s are capable of handling 140 watts per channel total input power without the manual protection engaged and 70 watts per channel with the protection engaged. Ugraded Model with Improved Input/Output Connectors! The upgraded, European-style removable input/output connectors give you better leverage when terminating cable and accept up to 14 gauge cable. The ISS’s feature 16 gauge steel construction with our durable black wrinkle powder coating and gray silk-screening. Each unit is provided with an in-depth instruction sheet and die cut labels that fit the recessed area on the buttons for labeling each zone. The 8.5" chassis width of the ISS4 combines with other 8.5" wide OSD Audio components (which will be available in the future) to make a standard 17" wide unit. What is the difference between the High Power 8-zone power selector OSD-ISS8 and this unit, ISS8 8-zone speaker selector - B stock? The High Power is out of stock. Is it worth waiting for? Hi Joe, B-stock means it's pre-owned/used. We also have the DSM8.